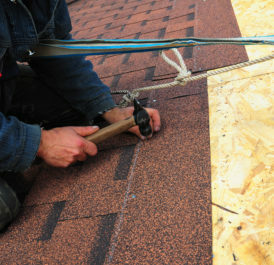 Whether you need a full roof installation project or just maintenance and repairs for the roof on your home in the Collinsville, Illinois area, Daech & Bauer Roofing is the company to turn to. Designated as one of the Top 100 Roofing Contractors in the U.S. by Roofing Contractor magazine, Daech & Bauer is a full-service contractor that has completed more than 10,000 projects in the region. Daech & Bauer also looks out for its customers by offering an “apples to apples” price guarantee. This states that we will match any local roof installation contractor that quotes a lower price for the same products and services. Additionally, we offer a standard five-year labor warranty on the work we do to give our customers peace of mind. Contact Daech & Bauer Roofing today if you would like to receive a free estimate on a roof installation or repair project for your home in the Collinsville, IL area.